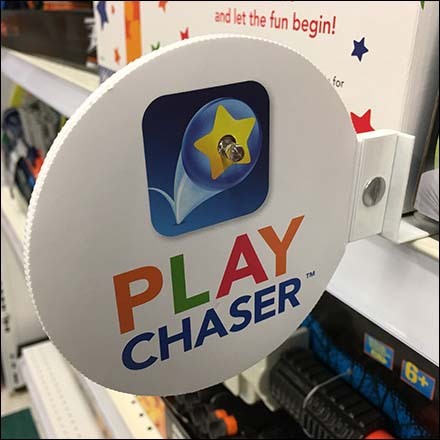 This Shelf-Edge Flag Promotion for Play Chaser makes sure you don’t have to chase very hard to find what you are looking for … use the Mobile App. A full size dimensional provides for direct frontal presentation but the circular Shelf Edge Flag calls attention up and down the aisle. This Shelf-Edge Flag Play Chaser Promotion seen at Toys R Us. Download the App free at the Apple App Store or Google Play. For Shelf Edge & Hook Flags posts by Title see..